Yeah, yeah, I know there are no more book spoilers to be had. But even if things are to come out differently than GRRM intends*, who’s to say there won’t be callbacks to stuff that was cut from the books? In any case if you’ve read the books, you can speak freely here. Well, the cynic in me came prepared for major fanwank, but damn if that new OP didn’t melt my heart - it gave me the excitement that I got with episode 1 (of which I got little tidbits of every time they introduced a new location animation). And damn if it wasn’t nice seeing so many character pairs reunited after so long. I had a huge grin on my face for the whole dragon-riding sequence. I kept thinking back to the “Dance of Dragons” novela. Also, is it just me, or did Rhaegal look greener than he has in years? I could actually tell the dragons apart for once. * See my rant here. 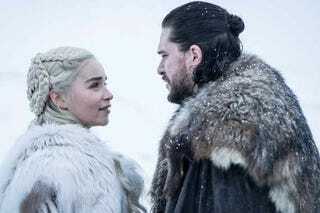 Edit: I’m calling it now: Game of Thrones will end with the establishment of a constitutional monarchy with Jon & Dany as the William & Mary of Westeros.